This is no biased preference for the written word over the spoken; I am far from a champion of a Eurocentric paradigm of literacy. This is about scholar versus talker. Improvisational speaking bears its wonders: the emergence on the spot of turns of thought and pathways of insight one hadn’t planned, and the rapturous discovery, in front of a live audience, of meanings that usually lie buried beneath the rubble of formal restrictions and literary conventions. Yet West’s inability to write is hugely confining. For scholars, there is a depth that can only be tapped through the rigorous reworking of the same sentences until the meaning comes clean—or as clean as one can make it. It’s not a matter of skillful editing, either, so that the verbal repetition and set pieces that orators depend on get clipped and swept aside with the redactor’s broom. It’s the conceptual framework that suffers in translating what’s spoken to what’s written, since writing is about contrived naturalness: rigging the system of meaning to turn out the way you want, and making it look normal and inevitable in the process. 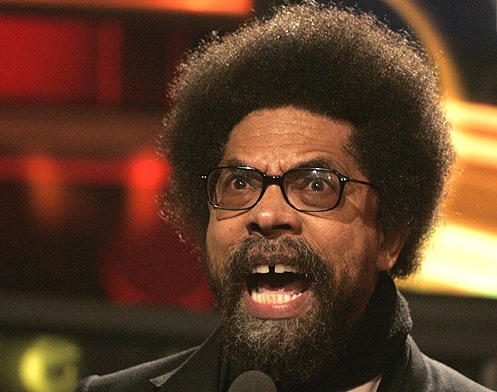 I redacted the quotes not including the specific comments about how Cornel West operates in the role of the speaker and chose to lift up the reflection on writing. One of the biggest complaints that many people who have a public opinion about our culture, and those who operate as some form of armchair critic is that it’s hard for them to write. Even Tanehesi Coates, in the YouTube video above offered up the ways in which it’s just that damn difficult. I have to admit, whether people see it or not, that I am a writer. My Twitter profile has “writer” listed first, because that’s really who I am. I may also be the other things on that list, but writing is what I do and have been doing. It wasn’t until I was grown and living on my own in New Orleans when I purchased [yet another] manual typewriter and wrote a letter to a friend of mine who was a co-worker that I realized just how long I had really been writing: I wrote my first book in second grade at the age of seven. The book, in the form of a play Grandmother and Son, I now realize, was an outgrowth of me dealing with my grandmother’s death the year before, but it was my first foray into creating a story, into imagining a narrative that was my world. It also helped that my school participated in the Illinois Young Author’s Program and just the mere entry merited a trip down to Illinois State for a day to meet with other students from across the state who wrote and bound their own books. I kept writing through high school creating a weird, narrative of everything that I wasn’t. In the 6th grade I created the character Robert Maurice Jones who was the eldest of three–I was an only child, who lived in San Francisco–I was absolutely fascinated with the Bay Area geography at that age. By the last entry in 8th grade, Robert’s mother had had triplets–I really hated being an only child and the family had moved to Philadelphia–that was my new geographical interest. I continued writing about this family, and had created a family tree that extended out, and was simply trying to work out my own problems through a character–he was a bit fairer in skin tone than I was, he had hazel eyes, and his hair was straighter and lighter than mine–and by the time I reached college, I found comfort in his youngest brother. Carrying the story forward some years, his younger brother, Solomon, was a ethereal existence from the Jones family that existed earlier. Solomon had the pleasure of exploring other worlds of fantasy beyond our known one. My sophomore year I had written over one-hundred pages hand written in my own world where I controlled who lived, who died, who looked like what, and how they interacted in social life. Suffice it to say, I am a writer. As I made the jump over to non-fiction works through the blogosphere, at this point, I’ve surpassed the 1,000,000 word mark as far as this blog is concerned if you combine all of my works since 2007 and this doesn’t count the words within my homiletical endeavors as well. Using Malcolm Gladwell’s expounded theory of the 10,000 hour rule, I’ve more than logged those hours. Writing comes naturally to me. I don’t say that to brag, but I say it as a means of acknowledging it as a gift. There have many posts that I’ve written here that were the machination of one thought that I started writing; and I’ve been able to produce close to 3,000 words in one setting. It exists as a mix-match of facts that I feel opinionated about all the way to just random musings that end up on the screen. I understand not everyone can do that, and moreover that different types of settings require different types of written work. By no means are the million words I’ve written qualifiable as academic work, but by all means they do exist as public. In about 9,500 words, Dyson wrote what many were thinking about West’s public scholarship and many are saying that wordspace could have been used to discuss some vastly different things. Part of being a good writer is being able to be a provocateur; how can you say something so incongruous that it will make you famous. Dyson excels beyond peer in this regards. If I had my druthers and Dyson asked me what I think he should use his platform to write about I would have suggested that an essay about the post-Ferguson era would have been needed by now or that he could have written about the general perils of celebrity black public intellectuals and what does it mean to balance the pressures and expectations of the academy as well as manage public expectations of being not just an intellectual but black society requiring a form of activism. If you’re reading this and you have something to say, it’s not too late. Go and click “New Blank Document” in your Word file and just start writing. No one else can do it for you. Might as well start today. I am delighted that Dyson has started a new conversation. I exhaled. Wonderful work, write on, keeping it uppity. Very informative and thought provoking! Great insight! Public ruin for private redemption? Or, simply it is what it is? Is it uppity and what is the path forward? The entire Marc Lamont Hill interview with Michael Eric Dyson (with earlier Cornel West video) is 46:37 minutes. Find the time to watch, IMO. Uppity is rooted in speaking truth to power.